This one is not for the faint hearted folks: a testing and adventurous drive through some of Australia's most rugged terrain. So pack the camping gear into your hired 4WD and prepare to be blown away by the mystical beauty of the Kimberleys, where deep red sand and rock formations and lush green vegetation provide a home to the widest diversity of Australian wildlife in Western Australia. Please note that due to the rough nature of some of the roads you will be navigating this drive is not to be attempted with anything other than a 4WD vehicle. From Broome you head north to Derby, where a night is spent in preparation for tackling a section of the Gibb River Road, which is the 4WD option of crossing the Kimberleys. Once used to drove cattle to Derby for export, this dirt road takes you right throught the heart of cattle country and past some of the most amazing gorges and rock formations you are likely to see. You will drive up this road as far as Windjana Gorge National Park where you set up camp for your second night on the road. Enjoy the natural beauty of this gorge before driving further into the Kimberleys to Bell Gorge, which is where you spend your third night. The mysticism of the expansive red land and the lush plants around you will be hard to leave behind, but you strike out south for Fitzroy Crossing the next morning. Stop in at Tunnel Creek on your way down to see the amazing cave formation, and once in Fitzroy Crossing you can spend time exploring the beautiful Geikie Gorge. Then it's back to Broome, for a deserved time relaxing on the infamous Cable Beach before you have to take your Discovery rental back. This is an easy drive of 220 kilometres to ease you into your road trip. Going straight up the Great Northern Highway, this will take you about three hours. 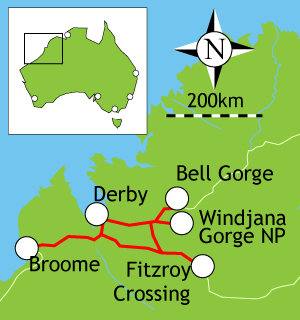 Derby is a sprawling and decentralised town, as is typical of many towns in this part of Australia. Characterised by its population of large Boab trees, this was the pioneer town of the Kimberleys, and you will find adventures of your own in the surrounding regions. Just a short flight or a boat cruise away is the Buccaneer Archipelago. This amazing feature off the Western Coast consists of about 1000 rocky islands that rise dramatically out of the ocean, and are studded with beautiful sandy beaches and inlets. This region around Derby is famous for its large tides that reach up to 12 metres, and in the Buccaneer Archipelago these tides rush through the narrow gaps between the islands in such a ferocious manner they have been dubbed 'horizontal waterfalls'. An amazing sight and a must see for visitors. Just South of Derby is the famous Boab Prison Tree. Over fourteen metres in diameter, this hollow tree used to be used as an over night lock up facility by early police patrols. Its impressive size and its historical significance make it an interesting trip out of town. Keen anglers can try their hand at fishing on the Fitzroy River, which is richly populated with over 40 species of fish. These self contained cottages come in 2 or 3 bedrooms units or single rooms. There are extensive gardens around each cottage, which are stocked with color TV's, microwave, linen and fridges. There is a laundry on site as well. This is where the real adventure begins, as you roll onto the Gibb River Road for the first time. The 125 kilometre drive to the Windjana gorge will take you about 2 hours. The gorge consists of two 3.5 kilometre long red walls rising up either side of the alluvial floodplain of the Lennard River, which winds its way throught the whole of the Napier Range. The river only flows during the wet season, but deep pools remain up its length that provide a home to freshwater crocodiles and a base where numerous birdlife and the resident fruitbats can thrive. The gorge walk is a seven kilometre round trip that takes you up and down both sides of the gorge, giving you perfect views of the scenery and the wildlife. Perfect for photographers, this isolated and natural area is a superb introduction to your surroundings of the next few days. The only means of accommodation is the camping ground at the gorge. You pay your park fees and your camping fees at the ranger station upon entry into the park. There are shower, toilet and telephone facilities at the campsite. Make yourself at home but be sure to clean up after yourself for the next lot coming in. Turn back on yourself and head back to the Gibb River Road from Windjana Gorge. Turn east and carry on in this direction until you see the signs for Bell Gorge, which is one of the main tourist attractions in the Kimberleys. Located in the King Leopold Ranges Conservation Park and only a thirty kilometre drive and a short walk from the Gibb River Road, Bells Gorge is a must see. A stunning waterfall flows down a steeped rock face into a wide and deep plunge pool, surrounded by U-shaped cliffs, which is safe for swimming. There are flat exposed rocks surrounding the water that look as if they have been made for sunbaking on, and also provide an ideal tabletop for a picnic. There is an abundance of birdlife and wildlife in the area so be sure to take your cameras. There are two campsites at Bell Gorge. The first one you reach after 19 kilometres of driving from the Gibb River Road. Called Silent Grove, this is a standard campsite with the usual ablutionary facilities. It is unpowered. The more popular camping site is located on the banks of Bell Gorge itself. However, there are only ten spots available here, and it is done on a "first come first served" basis. This is also a standard camping ground with the basic facilities but nothing more. This 281 kilometre drive will take about three and a half hours, and although some parts of the drive are rough the scenery more than makes up for the discomfort. The principal attraction of this town is the Geikie Gorge, which is about fifteen kilometres north of the town. Here the Fitzroy River has cut deep into the limestone ground, carving steep high cliffs each side of the gorge. This alone is an amazing site, and while you are taking it in you may be lucky enough to see a fresh water crocodile nosing its way around the waters. Stingrays and sawfish also frequent these waters, and a wide diversity of birdlife has taken up residence in the immediate surrounds. You can take a guided tour of the gorge, which will inform you about the Aboriginal heritage of the area and some of the cultural practices that go on. Tunnel Creek is about 63 kilometres north of the town. Here the waters form the creek have cut a 750 metre high tunnel through the ancient limestone barrier reef system. The echoey cavern has amazing stalagtites and rock formations, but you will need a torch to see them! The Tunnel Creek National Park is accessible by non-4WD vehicles, so any travellers making the trip from Broome to Kununurra on the highway can give it a visit. Built on the banks of the Fitzroy River, this lodge has motel units, caravan sites, powered and unpowered camping sites set in fifty acres of landscaped natural bushland. There are also a variety of cruises and tours available from the front desk. Facilities include a swimming pool, a restaurant, a bar, laundry facilities and a fully equipped kitchen. Affordable and picturesque, this park is able to cater for every kind of traveller. This park is open all year and provides powered caravan sites and camping sites. There are limited lodges as well (built on stilts to beat the occasional flood waters). This is the last leg of the journey, and the 395 kilometres down the highway will take you about four hours and fifty minutes. Its recommended you leave early, so you can make the most of the sights and sounds of Broome before dusk falls on the last night of your trip. Twenty two kilometres of pristine white sand bordering the deep azure of the Indian Ocean has seen this beach voted as one of the five best beaches in the world! The unique thing about this beach is that unlike the rest in this part of Australia, it is safe for swimming. There is no threat from sharks or crocodiles! Do remember to watch out for stingers between November and April though. Camel rides up the beach are particularly popular. There are other amazing beaches, including Town Beach and Riddell Beach. At low tide at town beach you can see the wrecks of three flying boats shot down by the Japanese during World War 2. Riddell Beach is about eight kilometres out of town, and is the perfect place to escape from it all. It is surrounded by the red cliffs that you will have become very familiar with after your journey through gorge country, and these contrast beautifully with the blue of the ocean. Located thirty kilometres out of Broome, this is more of a destination for travellers needing a place to hold up for the night. It does have great dining and accommodation facilities, but being on the highway there is not much in the way of scenery.